Delta Rigging & Tools can load test equipment to 700,000 lbs at our facilities, and provides additional services to our customers by offering the testing of wire rope slings, chain slings, shackles, and various other lifting and rigging products using our fully portable 50,000 lb. Lucker Test bed. Our trained and experienced staff can recommend the right solutions for your overhead lifting and load challenges by meeting or exceeding the industrial and contractor equipment requirements. We perform on-site lift point testing, up to 20,000 lbs. per point. 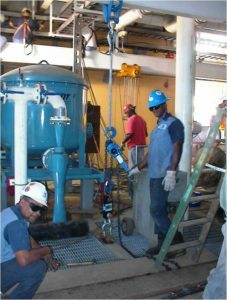 Our staff also performs in house testing of offshore baskets and boxes, spreader bars, and equipment skids. All testing and inspections (Re-certification) are performed by Certified Level II or Level III Rigging Inspectors. Our sales staff can engineer solutions by determining the proper construction of wire rope for your specific application. For more information, see the pages for certification and re-inspection. Load testing and re-certification, on-site or at one of our locations with online access to certification information 24 x 7 from anywhere in the world.